Pink Tea Latte: Latte Moment | My Adventure to Krause Berry Farms in Langley! 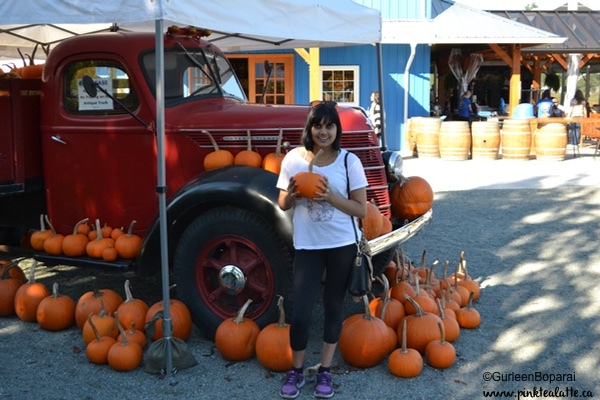 Latte Moment | My Adventure to Krause Berry Farms in Langley! I made it to Krause Berry Farms! SUCCESS!!!! 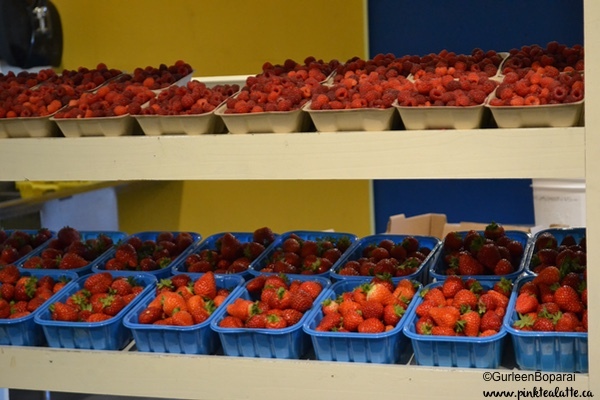 Yesterday I went on an epic adventure to Krause Berry Farms in Langley. What made this adventure epic is the fact I decided to take public transit from Richmond to Langly to the farm! The bussing part was easy, take the skytrain, get off at Surrey Central and hop on the 503 express bus. However, when we got off at Frasery Hwy and 248th Street --> it was a 6km trek to the farm.... whoops ... 1hr of walking! It was so worth the trek as Krause Berry Farms is absolutely gorgeous and is such a fun farm. They had the official giant pumpkin weigh off yesterday, the pumpkin patch, a barley maze, their winery, plus lots of yummy goodies! So many fresh picked berries! Wish I could have taken them all! You could smell the berries - thats how fresh they were! I am really upset that I missed the fresh waffles with fresh berries. We were just so hungry and tired from our trek that we headed towards the first food in sight. I had the fresh corn pizza. It was amazing! The corn was sweet and juicy and with a little bit of pizza sauce on a pizza crust, this was a mind blowing creation! I hope to get back there soon to have more of the corn pizza and also to try their waffles! 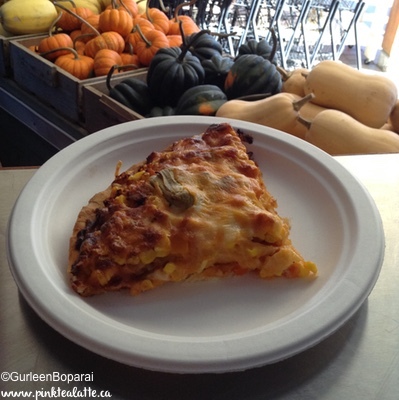 Corn Pizza - Why is this not a regular pizza flavour? It was delicious! After my friend and I got some energy in us, we went on to explore the property. We got really lucky that it was a hot sunny day out so it was fun to explore! We checked out all the berry plants, explored the barley maze and even got a bit of wine tasting in! I cannot believe I forgot to grab a little pumpkin home with me, but it would have been a large journey home. I ended up leaving with a delicious fresh pumpkin pie. It was so fragrant with all its spices. It was a struggle to not give in on the bus ride home. I also brought home some fresh strawberries and raspberries. Made a delicious smoothie of it this morning! 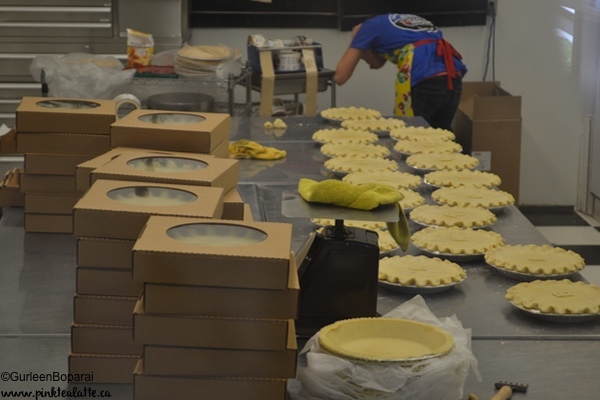 Fresh pies in progress! These were Raspberry! Thankfully we were able to get a taxi ride back to the bus stop as I do not think either my friend or I were up for another 1 hour trek back. All in all, a fabulous trip and I hope to get back out to Krause Berry Farms soon!